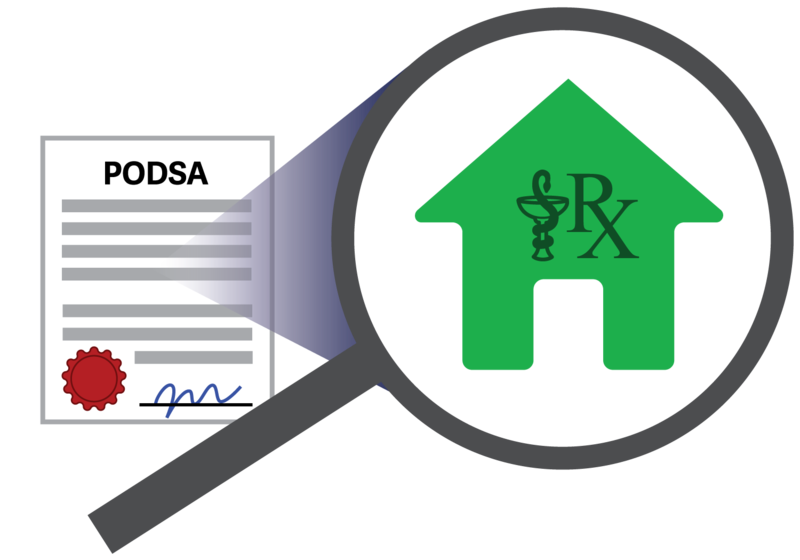 In June 2017, the College Board approved amendments to the bylaws, forms and schedules under the Pharmacy Operations and Drug Scheduling Act (PODSA) to support the new pharmacy ownership requirements for a public posting period of 90 days which ended on September 20, 2017. The College Board will consider approving these bylaws for a 60-day filing period at their November 2017 Board meeting. Subject to that decision, the new requirements are anticipated to be in-force by March 1, 2018. Existing pharmacies must meet the requirements of a new pharmacy license application when they renew their licence during the transition period. The first group of existing pharmacies that will need to meet the new requirements will be those pharmacies whose pharmacy licence expires at the end of May 2018 even though the PODSA amendments will be approved earlier. The transition period ends after all pharmacies have gone through the transition period. In a sole proprietorship, one person owns and operates the business and is personally responsible for its liability. Within the context of PODSA, this person must be a registered pharmacist and is considered the "direct owner" of the pharmacy. General Partnership – This is when the partners manage the business and assume responsibility for the partnership’s debts and other obligations. Limited partnership - This is when the business has both general and limited partners. The general partners own and operate the business and assume liability for the partnership, while the limited partners serve only as investors with no control over the business and who are not subject to the same liability as the general partners. Like sole proprietors, general partners are personally liable for the partnership’s obligations. In the context of PODSA, all partners, regardless of type, must be pharmacists and each partner is the “direct owner” of the pharmacy. A corporation is an independent legal entity, separate from its owners. In the context of PODSA, the corporation that holds the pharmacy licence is the “direct owner” of the pharmacy. Corporations that are direct owners must be incorporated in BC. Directors: Directors oversee the affairs of the corporation and protect the interests of the shareholders. In the context of PODSA, Director refers to a member of a Board of Directors of a corporation. A member of the organization with job title containing the word “Director,” (e.g. Director of Operations) may not be a Director under PODSA. The new PODSA requirements state that the majority of a corporation’s Directors (i.e. over 50%) must be pharmacists registered with the College. Officers: Officers are appointed by Directors to oversee the day-to-day operations of the business. Officer positions include: CEO, COO, CFO, Treasurer, Secretary, etc. Shareholders: Shareholders have an ownership interest in the corporation by virtue of a monetary investment. Indirect Owners can be individuals or corporations. A corporation is an indirect owner if it is a shareholder of the direct owner or another indirect owner – they are often called a “parent company” or “holding company”. Learn more about authorized representatives in this ReadLinks article. Each indirect owner of a corporation will be required to provide Proof of Eligibility when applying for, renewing or reinstating a pharmacy licence. The elements of Proof of Eligibility will be discussed in greater detail in a later article. For shareholders that are corporations, only those that are BC incorporated, non-publicly traded corporations will have to provide the same corporate documents listed above, information about their directors, officers and shareholders, as well as their proof of eligibility. Direct Owners – If the Direct Owner is a publicly traded corporation, a Director of the corporation will have to provide the names, College of Pharmacists of BC registration number/eServices ID (if applicable), and email address for all Directors and Officers of the corporation. Shareholders’ information is not required. Indirect Owners –Indirect Owners that are also publicly traded corporations are not required to provide any corporation information or email contacts. 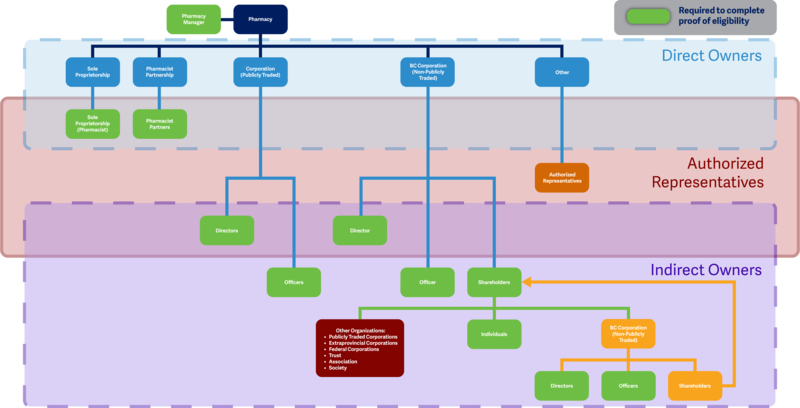 The following diagram outlines the pharmacy licence renewal process during the transition. If your pharmacy is owned by a sole proprietorship or partnership of pharmacists, the pharmacist-sole proprietor or each pharmacist-partner will receive the renewal notice and have to complete all the renewal requirements in the same timeframe as a Director of a corporation.